Just received these precious whisks today less than a week after I ordered them. I was blown away by how sweet they are and what perfect little boxes they come in, including a tiny ribbon and bow. I LOVE them, and know they will be a hit at my daughter's bridal shower next month. I will definitely order from Beau-Coup in the future! I love the way they come packaged , ready to put on the tables. We gave these as favors for a Grad from The Culinary Institute of America. I bought these for a kitchen shower and they were a big hit! A nice twist on a functional item. This is such a great little memento for a bridal shower and a great way to thank the guests for helping make the day special for the bride-to-be. I know whenever I use this whisk (and I will use it), I will think of the couple. I loved this product because my fiance and I are both Chefs. It didn't really have a theme in common with ours, but because it was functional and unique we thought our guests would remeber it forever! This is the cutest/nicest little gift!! This is the best little gift I have EVER seen or purchasesd! I am a Beaucoup customer for life! Great product, fast delivery. The product was adorable and good quality! These are so cute and functional. I purchased them for my niece's shower. Everyone loved them and said that they will remind them of this happy occasion. I was so happy with the quality and the price. This product was used as a bridal shower favor for a bride that loves to bake and cook. It is functional and you can use it and we personalized ours on our own with a ribbon and recipe and they came out great! We attached the heart whisks to the cupcake boxes for my daughter's 10th birthday party at a bakery. Everyone loved them. it's the best gift for your wedding! i will use it on my weddind day. i don't find anything wrong about it! "whisked away" is right! huge hit!!! We loved them for our kitchen themed bridal shower! So did the guests! The small whisk is very cute and functional. I purchased these for a bridal shower party favor and am very excited about sharing them with our guests...I know the guests will love them as much as I do!! Who doesn't need "whisked Away" every now and then!! We bought this whisks for my daughter's bridal shower. It fits perfectly the baking theme. They are cute and different! They're small. I think that they're great for mixing sauces or things that are not that heavy to mix. Perfect party favor for my daughters bridal shower. Quality was good and will be a useful gift for the quests. So glad I ordered and would definitely recommend to a friend. These were PERFECT for the brides cooking themed shower! They came packaged beautifully and looked great in a large basket with pre-packaged teas, so that the guests could help themselves after the shower!I wouldn't change a thing and highly recommend them as a favor! They are also USABLE!! !Love this product! These are adorable and useful and a great value for shower/luncheon favors! We gave these out as favors for my sisters Kitchen/Cooking themed Bridal Shower. Everyone loved them and talked about how cute they were! I wish they were a little bigger, not the size of your typical whisk but the handle is long enough that you can still use it to mix most things. I AM USING THIS AS BRIDAL SHOWER FAVORS FOR MY DAUGHTER. I LIKE THIS PRODUCT BECAUSE IT IS SOMETHING EVERYONE CAN USE AND THE THEME FOR THE SHOWER WAS BAKING. IT WAS ALSO VERY AFFORDABLE AND I DID NOT HAVE TO WRAP. I AM GIVING THEM OUT JUST AS THEY ARE. The whisk comes nicely packaged and made a good bridal shower favor. It is a little light weight and not super high quality but I still use it all the time and it's great for the price. The best bridal shower favor ever!! Everyone at the bridal shower thought they were the best most useful gift ever!!!!! They were super cute, affordable and practical. Everyone loved them so much at the bridal shower, and since we invited over 60 people keeping the cost down was a must. Having the ability to order in bulk to lower per unit price was a major benefit too. The boxes made presentation wonderful! I ordered these whisks for a bridal shower. They were perfect for our cooking theme! They are not cheapy favors that you will have to throw out in a month! So many guest commented that it was just the right size! This product was so cute and all the guests at the bridal shower loved them. Some said its useable while I can see that it's not the most useable thing. Not super fancy but not cheap or flimsy either. End result, it was a huge hit and everyone thought it was adorable. it was perfect size and price simple. I love to bake and my husband is a pilot. 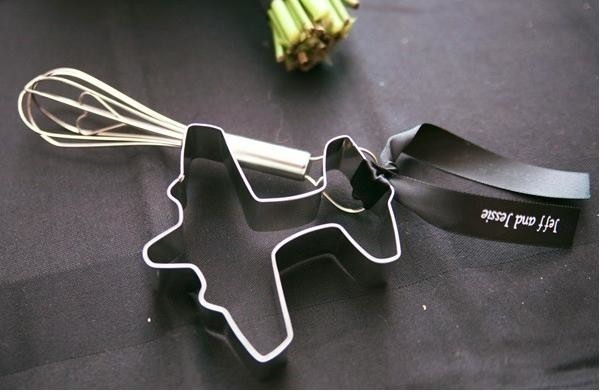 We bought the whisks and tied them with a custom ribbon to an airplane cookie cutter. Everyone LOVED them and they were very representative of the both of us. Heart whisk - pair with hot chocolate! We gave these as gifts to our guests at the shower who helped us put together a recipe book for the bride. Along with the heart shaped cookie cutters it was a hit! These little whisks were the perfect bridal shower favor! Everybody loved them! They came beautifully packaged and ready to give! These whisks were so adorable! I bought the gourmet cupcakes and had labels made for the boxes. Then I tied a whisk to the top of each one. It was really well put together and very much appreciated by all the bridal shower guests. I SAW THIS ON THE WEBSITE AND THOUGHT THEY WERE SO CUTE. THIS IS SO PERFECT FOR MY SISTER'S BRIDAL SHOWER. SHE LOVES TO BAKE AND FITS HER PERFECTLY. THIS WEBSITE WAS SO HELPFUL BECAUSE IT GAVE SO MANY DIFFERENT OPTIONS ON FAVORS AND OTHER IDEAS. I WOULD HIGHLY RECOMMEND THIS WEBSITE TO ANYONE WHO IS THROWING A PARTY OF ANY KIND. I purchase the whisk for favors for my daughter's bridal shower and all the guest absolutely loved them. So did the Bride!!! Everyone loved the favors. They were perfect for the theme of the grill for him/kitchen for her couples wedding shower. [...] The logo "whisked away" was cute and appropriate. We gave these as a favor at a Receipe Shower for my daughter and they were a real hit. These favors are so cute and were such a big hit at the bridal shower! This product was great at my future daughter-in-law's bridal shower. Everyone was very impressed by the detail of the whisk. I also thought the item was priced right. These are so cute and practical! I am very glad that I ordered them for bridal shower favors. For the kitchen-themed bridal shower! Everyone loved the mini heart whisks! And they are functional as well as being a keepsake for guests to remember the shower by. The mini whisks are perfect for beating a single egg for recipes. You can personalize it by adding a colored bow to the packaging, but they are fine how they are. Just the right size, packaged beautifully and functional. It was the perfect bridal shower favor. This is a great gift which can be put to good use! You would never know how inexpensive it really is by looking at it! Very nice keepsake to let friends and extended family know you appreciate their participation and attendance at a shower for the couple. Adorable and practical. I have already used it a couple times- good quality and great size. Perfect keepsake. Everyone at the shower really enjoyed these favors. They make a great first impression in the box with the ribbon, and people appreciated getting something useful yet something with a romantic touch that will remind them of the shower. Much more practical than say, a candle, but you don't miss out on the sentimental factor. A great shower favor! I recently hosted a wedding shower for my Sister, we had 25 guests I purchased one of the "whisked away" whisk for every guest. My Sister is a really good cook so I told all of the guests thank you for coming and to think of Cassy when they were cooking and using the whisk. Everyone commented on how cute of an idea it was. I used with the heart shaped measuring spoons for guest favors at the wedding reception. Guests loved the idea and each couple went home with 2 new items for their kitchen. We presented this to all at a wedding shower as a party favor and they were a big hit. they were practical, useful and clever (heart shapes) for the shower. Everyone like the smaller size. I was very pleased with the quality. good for everyday use. It was great, gave it as a thank you to everyone who came to the shower - Everyone was thrilled and thought it was a great idea and an unexpected surprise! The whisk comes in a cute package...ready to hand out. I did not even have a kitchen theme and it was a huge hit with everyone. [...].Would highly recommend! The heart wisk were a fun topper to the personalized favors. Loved the concept however the plastic packaging was a bit cheap looking and distracting to the product. Very cute and I liked not having to order a minimum. My guests loved these! Very cute! The whisks are very cute. They were so well received at my first affair that I used them a second time as party favors. These made a very nice presentation. I added a card that said, "Whisk together love and affection", with the date and brides name of the shower. When planning my daughters bridal shower, I purchased 4 favors, the heart whisks are cute, however I chose the ice cream scoop. You can actually use it. It is great. Everyone that was giving the whisk thaought it was very practical. Great little addition to cupcake mix! I bought these to go with the cupcake mix I bought. They are small, and actually non functional, I think, but they add something to the cupcake mix to make it really unique. Fun idea, and kids would love them! Q:Can you personalize the tags or the box? Q:How much does each item weigh together with the box? A:These heart whisks are made in China. These mini heart whisks are perfect reminders of how love often whisks us away! Constructed in stainless steel with a heart topped handle, these handy little kitchen tools make wonderful favors for a recipe exchange bridal shower, cooking themed bachelorette party or a romantic wedding. 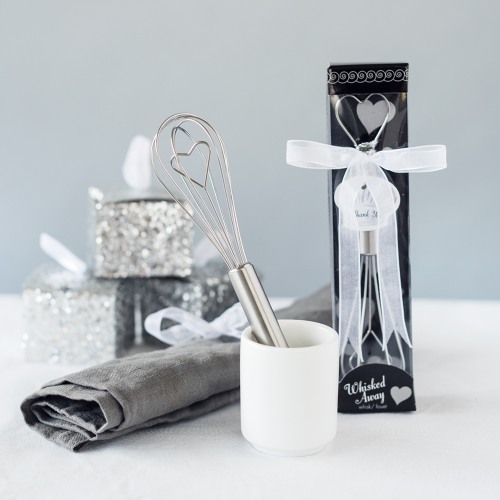 Each mini whisk comes gift wrapped in a clear topped box and tied with white organza ribbon. A "thank you" tag hangs from each and the words "whisked away" are printed on each box. Whisks measure 6" in length. Boxes measure 6.75" x 1.5" x 1.5".